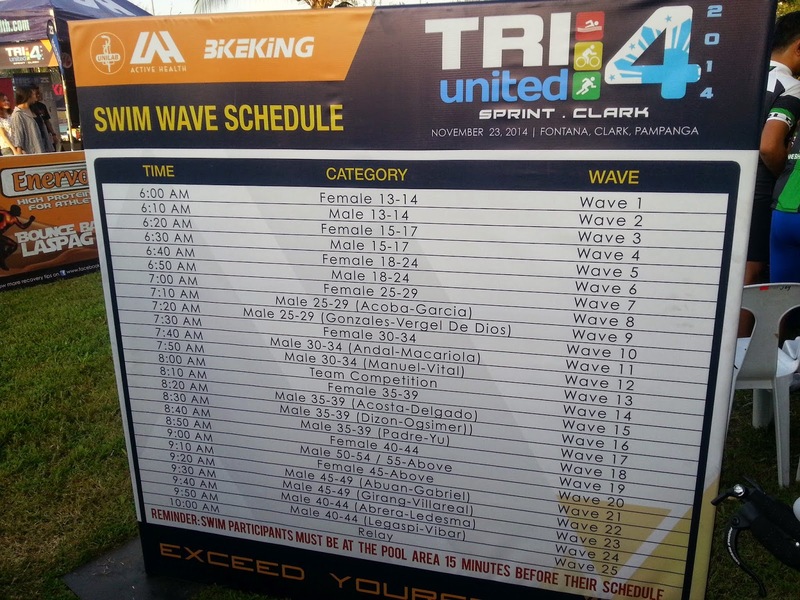 I traveled to Clark with my wife Saturday, one day before the race - Tri United 4 2014. We arrived in Fontana around 4:30pm. Claiming of racekits will be until 6:00pm and will resume again the next day from 4:30am. 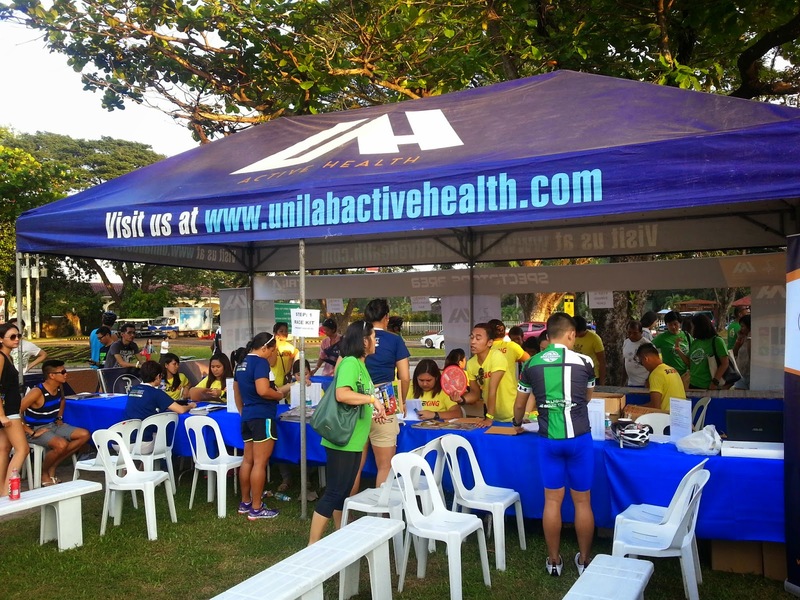 I didn't want to claim it on race day so we went immediately to the Unilab Active Health's tents. Not too many athletes yet in line so we were done in about 10 minutes. Then, we headed to the Fontana hotel to check-in. After putting our things in the room, we decided to take care of our stomaches especially that we've missed our lunch and really starving. With that, we ended up having a buffer dinner in one of the hotel's restaurants. After a delighttful carbo-loading dinner, we went back to our room. I unpacked the things for tomorrow's race then had a hot shower. I hit the sack at 9:30pm. I woke up at 4:15am. After preparing my things, I rode Tyrion (my road bike) and we headed to the transition area which is about 300m from the hotel. I took my bike and run leg kits and arranged them in my designated basket. Then, I returned back to the hotel. Because we still had plenty of time before my wave which will start at 8:30, we had a quick and light breakfast first. Drew Arellano and her wife Iya had breakfast too. 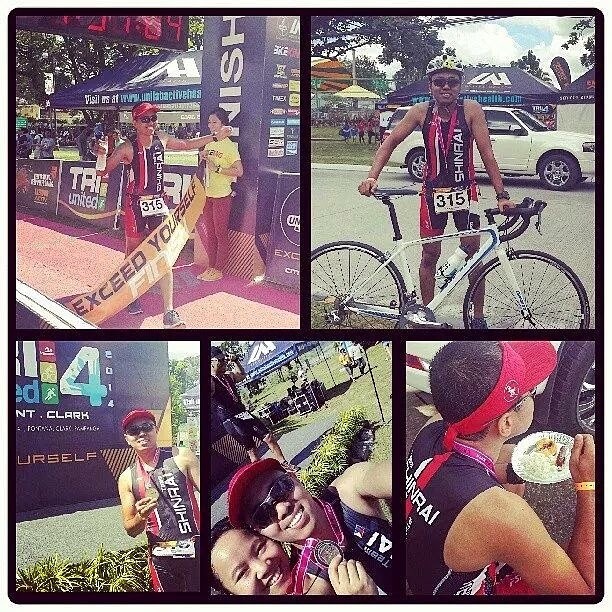 I later found out that Iya finished first in her age group and it was her first triathlon! Congrats! We went back to the room and changed costumes. I had an informal swim sessions with my friends few years ago but I only had my formal swimming class last June and finished the course last August. Technically, I just learned how to swim three months ago! I was nervous going into the pool area. But when I saw that there were few beginners too, I felt a little bit relieved knowing that I was not the only newbie. 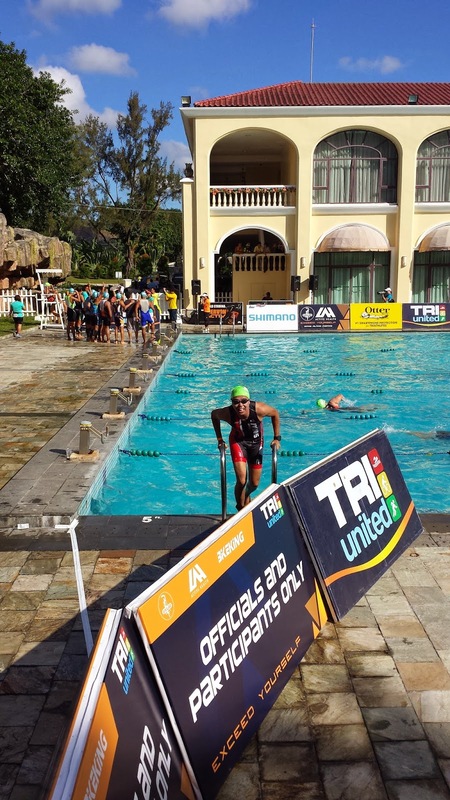 My plan was to swim slow, take few breast strokes if necessary and finish safe in 35 minutes. I positioned myself at the back of our group of around 20. After a short briefing and few words of encouragement from the host, we went down to the pool and off we go! I struggled to get my rhythm but I tried to push myself, to swim at my own pace. By the time I finished the first loop (300m), most if not all in my group were already heading to the transition area for the bike leg. We have to complete two loops to complete the swim leg. I finished the swim in 24 minutes 38 seconds. On a positive note, It was my fastest 600m swim to date! After watching the video taken by my wife, it was obvious that I need more practice to correct my form and improve my breathing hoping to do better next time. I learned how to ride a bike at a very young age, probably 5 years old and still vivid in my mind how I crashed in to the river when I was 6. But I got (gift from wifie) Tyrion one week before the race and road tested him only once. Before that, I had a 20km mountain bike ride three weeks ago. We need to complete two loops of the route for the 30km bike leg. From the start of the first loop, I tried to push hard as I could. But eventhough I thought I was already moving very fast, there were riders even faster leaving me behind, helpless yet inspired. How I wish I could chase them! The route going back after the U-turn was the most challenging part for me. 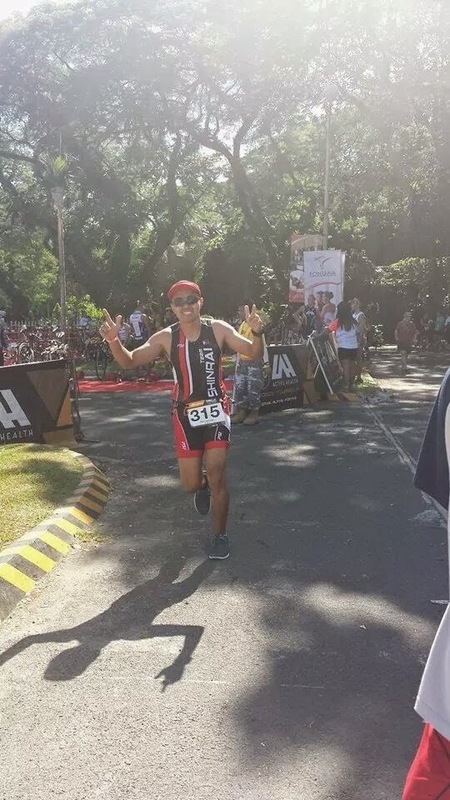 Maybe because of the wind or the the slight uphill or perhaps I just exerted most of my effort early on. I was slower going back. The second loop was the same story as the first loop, plus the heat. I finished the bike leg in 1 hour 20 minutes and 56 seconds. I had plenty of runs this year going into this race so I was confident I could improve my overall time with a good run. Unfortunately, it was not the case. The bike leg sucked almost all my energy that I had nothing left to push harder. Bike + run is a different story. Fortunately, there were trees along the route for emergency shade and the occassional free showers from the race marshals were refreshing. They gave some bursts of energy to push a little bit more. I crossed the finish line in 2 hours 21 minutes 3 seconds and my wife was there waiting, smiling, cheering. I couldn't have done this without her. It was a very humbling experience. An experience that tests your body, heart and mind. An experience to make you respect other people, to cheer for the people you love, to be happy for the accomplishments of others, to abide by the rules to be friendly, to inspire and be inspired, to cherish life and to count all the blessings we receive. Congratulations to all participants, finishers and winners. Thank you to the organizers, sponsors and marshals. It was a very well-organized event. See you next year! Thank you Lord for everything.